I'm linking up with Celia at Fig Jam and Lime Cordial and taking a little peak into other people's kitchens. 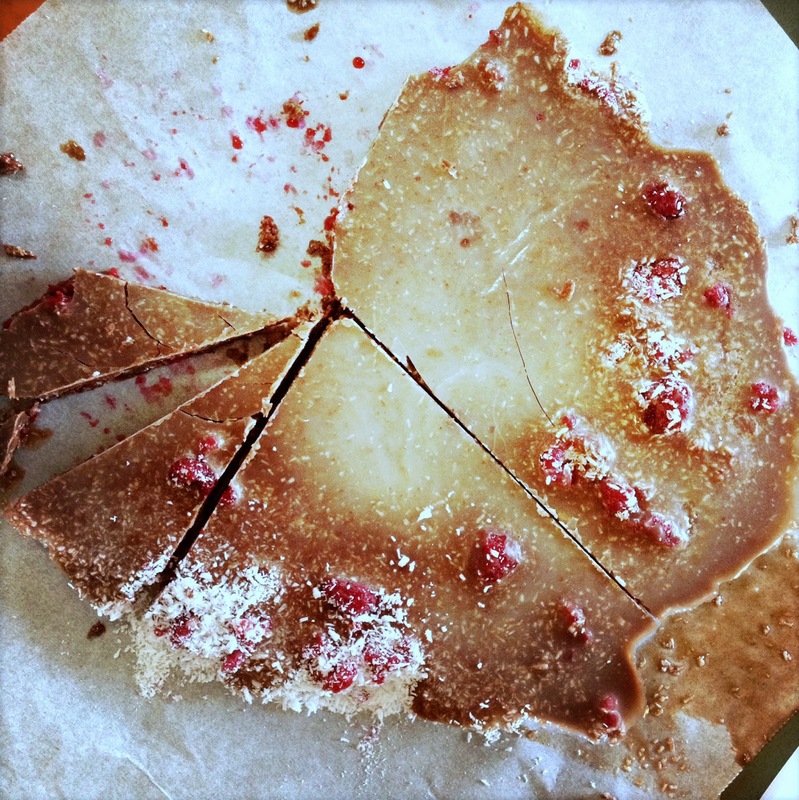 ...there is Choc Raspberry Ripple from Sarah Wilson's 'I quit Sugar'. This is the first time I've made this and honestly I was a little doubtful, but This. Was. Amazing. Coconut, raspberries and raw chocolate, and it's good for you! Need I say more?!? There is also a slow cooker on my bench full of warm milk which will hopefully become yogurt. This is another first for me - I've never made yoghurt in my slow cooker, so I'm so excited to see how this turns out. 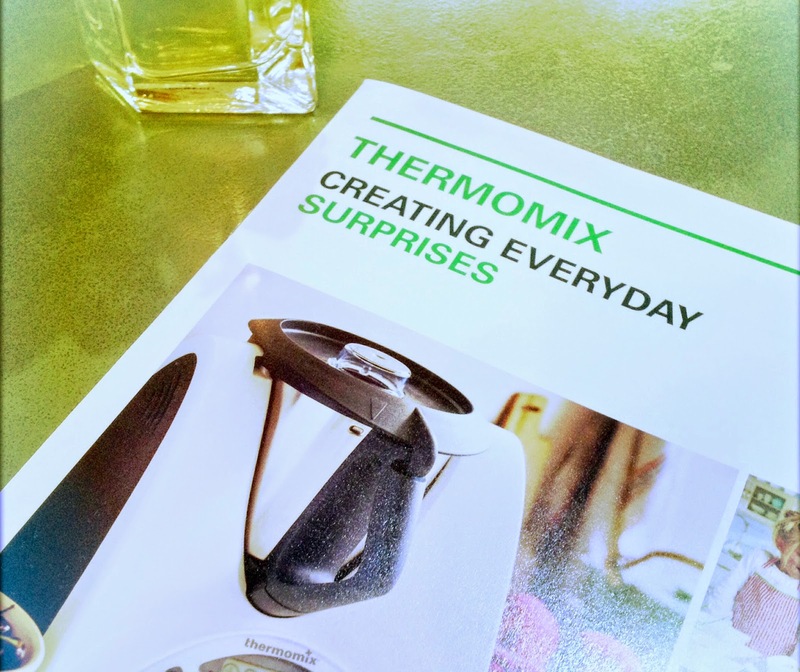 There is a Thermomix brochure - I've been to a demo and had a demo at my place yesterday, but I'm still not convinced that it's worth the whopping price tag? I mean, apart from being able to actually cook a meal in it, I'm thinking a food processor would be able to do the same thing? What do you think? ......and these lovely roses picked from my garden yesterday after a night of rain. Note: I must apologise about the quality of the pictures. They were taken on my phone as my 'real' camera is out of action at the moment. Thanks for a peek into your kitchen, Tania! 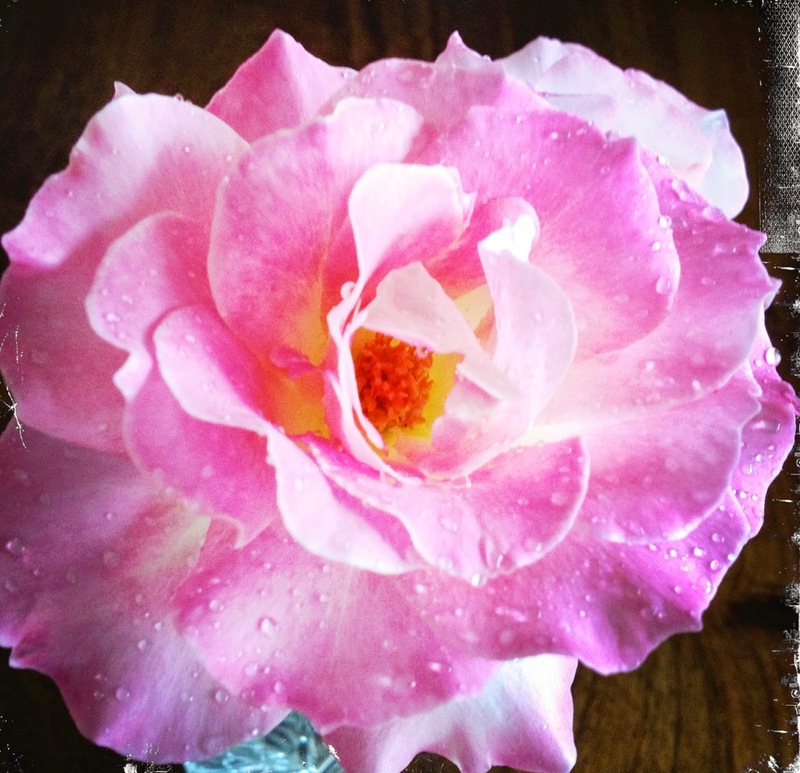 Pretty rose and nice pictures taken with your camera! Personally, the price tag of a Thermomix can't be justified, although I have several friends who have indulged with one and find it very useful in various ways. 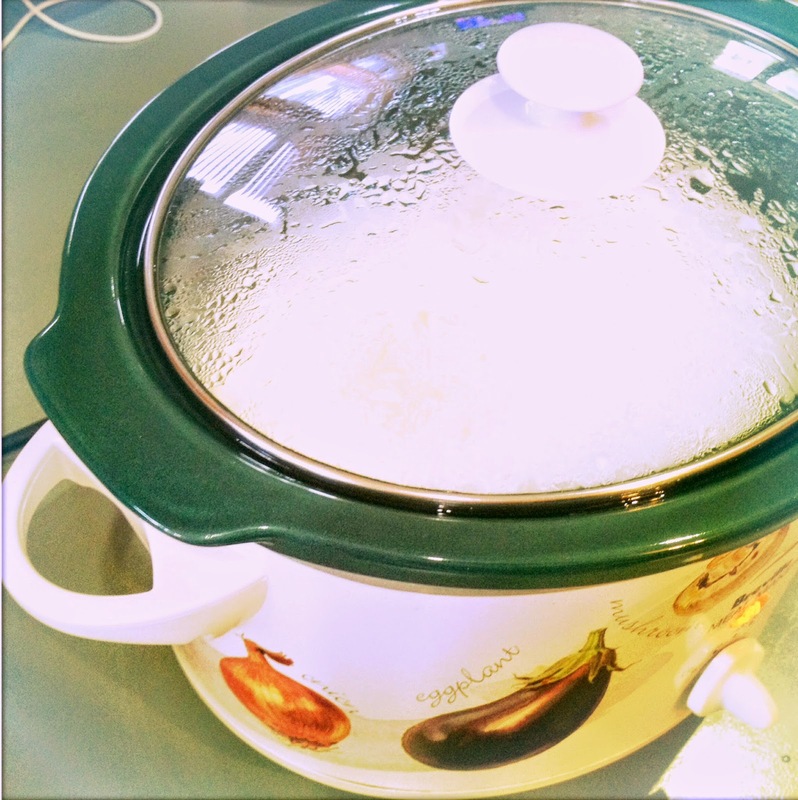 I am curious to know how your slow cooker yoghurt turned out and how did you go about doing it. Do you mind sharing the process and recipe, please? In anticipation...thanks very much! Welcome little sparrow. Don't even get me started on Thermox. Maybe if I didn't already have a food procesor and a blender and saucepans... Yes it can make custard in 7 minutes whilst you hang out a load of laundry but who actually does that? I'm, going to a demo next weekend but am also yet to be convinced. Onto other things... Lovely rose and with the droplets on it too. Thanks for the tour. See you back soon. Lovely post, thanks for playing! I don't have a thermomix, and have two friends who paid the money but never use theirs, and two other friends who use theirs all the time. I guess it depends on how much you actually like to cook - the Thermomix is a bit like a breadmaker for lots of dishes in a way - you put all the ingredients in and then let it do its thing. I prefer to handle ingredients and stir a pot. :) The chocolate ripple looks amazing, and yoghurt in the slow cooker is brilliant - hope it worked well for you! thanks Celia x I've made the Choc Ripple a few times since this one and it is as yummy as it looks. I'm not sure that I'm supposed to eat the whole thing in just a couple of days though - yes I need to work on my self control . G'day! What a lovely post I enjoyed reading today! I feel the same about the Thermomix, I just can't justify it and I love the tactile nature of cooking. Plus, I'm going to be the voice of dissent about the Thermomix. I've had mine for over four years and LOVE IT. I definitely don't use it every day and I don't use it to make many meals, but I can't imagine my kitchen without it. Yes it's $$ but we easily saved $2,000 in the first year of ownership. Especially as (for example) I can now buy bulk raw nuts and from those make my own nut butters and nut meals, which my food processor couldn't cope with. That alone saves mega $. Hi Mel, let me know how your raspberry ripple goes. thanks for your thoughts on the Thermomix too. Hi Tina, welcome to the IMK gang. What a beautiful coloured rose. Look forward to seeing how the yogurt goes, might find a use for my slow cooker. Hi Tina, If you are thinking about getting a Thermomix, consider a Vitamix. I went to a Thermomix demo too but decided I didn't want to cook in a blender. A Vitamix is a very very powerful blender, it can do all the blending things a Thermomix can do. I use mine all the time and love it. A Vitamix costs about $1,000 which is a lot less than a Thermomix.